Blue Vail by Madeline Ellis - 10.000" x 6.625"
Blue Vail framed print by Madeline Ellis. Bring your print to life with hundreds of different frame and mat combinations. Our framed prints are assembled, packaged, and shipped by our expert framing staff and delivered "ready to hang" with pre-attached hanging wire, mounting hooks, and nails. Beautiful, beautiful, beautiful ... love seeing places I have never been! Craig, thanks for taking a look at Blue Vail and your very nice comment. Cool shot I love the colors!! A very beautiful snow scene Madeline ! Cool blue! Love the treatment - reminds me of a winter scene!! Lori, thanks so much for your very nice comment. Wow! This is awesome! 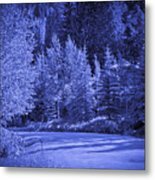 Love the monochromatic tones of blue. 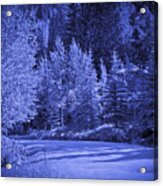 Gives you the cool feeling of the snow, but the light sparkling through the trees give you a feeling of warmth! Love it! Thanks so much for your comment. I have no clue when you sent this. I am sorry for not responding sooner. Stunning color, Madeline. Wonderful capture of light and shadow. Ann, thanks for your very nice comment. I am only sorry I didn't say this sooner. Madeline this is so beautiful!! 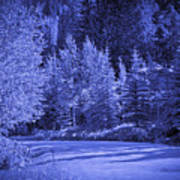 Love the blue hues of the snow and trees, is gorgeous!! Julie, thanks so much. I am sorry I didn't respond sooner.